* Closed on Mondays (except Holiday Mondays,) and Jan 1st. The museum is closed on Mondays and January 1. The museum is closed on Mondays, except for Holiday Mondays. During weeks with a Holiday Monday, the museum will be closed on the first non-holiday weekday. 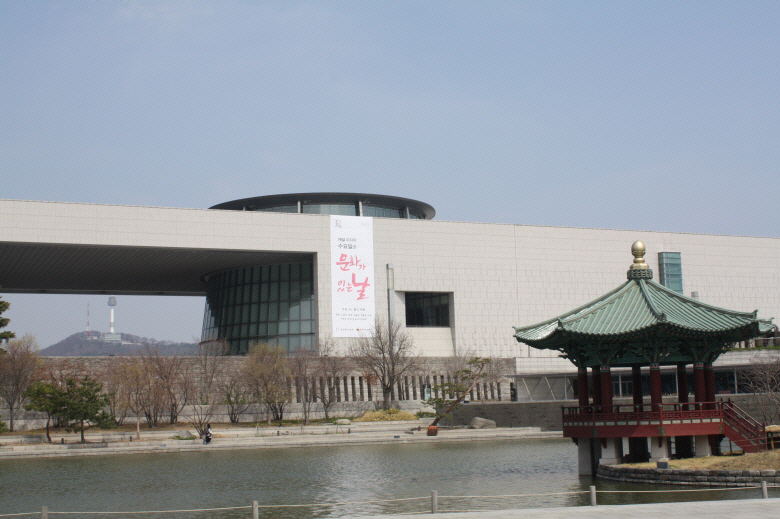 The National Museum of Korea is the most representative and extensive museum in Korea. More than 12,044 of those pieces are always on display in our six permanent exhibition sections, where visitors can examine numerous national treasures of Korea, including Pensive Bodhisattva (Korean National Treasure No.78 or No.83), Goryeo Celadon Openwork Burner (No.95), Ten-Story Pagoda from Gyeongcheonsa Site (No.86), and Gold Crown from Silla (No.191). The museum is divided into three floors. Symbolically, the left of the museum is supposed to represent the past, while the right side of the museum represents the future. The ground floor contains parks; gardens of indigenous plants; waterfalls and pools; and a collection of pagodas, stupas, lanterns, and steles (including National Treasure of Korea No. 2, the Great Bell of Bosingak, the exemplar of Korean bells of the Joseon period). The Paleolithic Age marks the cultural genesis of humanity, as the first humans separated themselves from their anthropoid relatives by beginning to make tools and use fire. The Korean Peninsula has been inhabited by people for around 700,000 years, and its earliest inhabitants were hunters and gatherers who moved from place to place in search of food and usually lived in caves or near rivers. Depending on the progress of human evolution and the development of tools, the Paleolithic Age can be divided into three different periods—the early, middle, and late Paleolithic. The early Paleolithic was the period of Homo erectus (“upright human”), who used large stone tools with various functions, including stone choppers and hand axes. The middle Paleolithic was marked by the rise of Homo sapiens (“wise human”), denoted by a wider range of smaller stone tools with more differentiated functions. The latter period is dominated by Homo sapiens sapiens, also known as anatomically modern humans (AMH). During this period, the first stone blades appeared, and the efficacy of stone tools and their manufacture continued to develop. Soon, more sophisticated tools emerged, as people combined small blades with branches or animal horns. Excavations of late Paleolithic sites on the Korean Peninsula have uncovered choppers with pointed ends (sumbezzirugaes), which are small stone blades commonly found in Northeast Asia. Such discoveries represent crucial evidence of exchange with neighboring regions. In the Neolithic Age (8000 BCE – 1400 BCE), people began adapting to their changing natural environments after the Ice Age. The period is marked by the creation of earthenware pieces and ground stone tools, and the foundation of the first settlements. Thus far, about 400 Neolithic ruins have been found throughout Korea, in the form of dwellings, tombs, shell mounds, and more. The best known ruins include Amsa-dong (Seoul), Osan-ri (Yangyang, Gangwon-do), and Dongsam-dong (Busan). In Korea, the Bronze Age began around the 15th century BCE, with the everyday use of mumun pottery, ground stone tools, and wooden tools. During this period, only a few people possessed bronze tools, which served either as symbols of authority or as ritual instruments. Agriculture continued to develop, including the onset of rice farming, which led to the accrual of larger settlements that resembled the rural villages of today. Notably, this era also saw the establishment of social class, including the appearance of the first Korean nation of Gojoseon. Gojoseon lasted until the Iron Age, flourishing mainly in the northwest of the Korean Peninsula and challenging the Yan, Qin, and Han Dynasties of China. In fact, Gojoseon was powerful enough to defeat the Han in an early conflict of a war that lasted about a year. Nevertheless, the prolonged war eventually triggered internal strife that brought on the collapse of Gojoseon in 108 BCE. After the fall of Gojoseon (108 BCE), the Korean Peninsula was divided among a number of local dominions. Buyeo (2 BCE – 494 CE) and Goguryeo (37 BCE – 668 CE) ruled the northeast area near China, with Okjeo and Dongye also occupying northern areas, while the central part of the peninsula was controlled by Samhan, which comprised the confederacies of Mahan, Jinhan, and Byeonhan. The levels of social development of these early civilizations varied according to their national power and location. Over time, Buyeo and Goguryeo grew into ancient states by asserting their capabilities in both culture and warfare. As a result of various conflicts, Goguryeo took control of Okjeo and Dongye, while Mahan, Jinhan, and Byeonhan integrated into Baekje (18 BCE – 660 CE), Silla (57 BCE – 676 CE), and Gaya (42-562 CE). The Goguryeo Kingdom (37 BCE – 668 CE) arose along the middle reaches of the Amnokgang (Yalu). By conquering neighboring regions, the kingdom eventually encompassed a huge area, from the Liao River to the central part of the Korean Peninsula. While maintaining its own cultural tradition, Goguryeo also actively embraced diverse cultures from China, as well as Central and Northern Asia. Thus, Goguryeo culture is both dynamic and practical, and it exerted tremendous influence on Baekje (18 BCE – 660 CE), Silla (57 BCE – 676 CE) and Gaya (42-562 CE), and even crossed the sea into Japan. Tomb murals of Goguryeo are among the internationally recognized cultural legacies of Korea. The most frequent themes of the murals are daily customs, decorative patterns, and the guardian deities of the four directions. Goguryeo culture passed on to Unified Silla (676-935 CE) and Balhae (698-926 CE), and thus formed the backbone of Korean culture. Baekje was a state that originated from Baekje country which had been established on the Hangang basin by Buyeosettlers gradually integrated Mahan regions. After that, as the state moved its capital to Ungjin (Gongju at present), and Sabi (Buyeo at present). It flourished a unique culture. Hanseon period (18 BC – 475 AD) is marked by establishing the foundation of Baekje culture, which is open and international. The characteristics are re-confirmed with dwelling sites such as Seokchon-dong Tomb, Monchontoseong (castle) and Pungnaptoseong (castle), etc. The Ungjin Period (475-538) is the time when the state actively embraced the advanced Chinese civilization and developed into a cultural power. It can be conjectured by the Royal Tomb of King Muryeong and the excavated artifacts that indicate the relationship with the Southern Dynasty of China. Sabi Period (538-660) reached the summit of Baekje culture when original plastic arts and sophisticated handicraft technology were fully developed. This is the time when Baekje Incense Burner, the very epitome of spiritual world and artistic abilities of Baekje people was made. On the other hand, Baekje culture was transmitted to ancient Japan from the early years and exerted an influence on the formation of Ancient Asuka Period in Japan. The Gaya Confederacy (42-562 CE) was cultivated through the abundant iron resources available in the mid- to lower regions of the Nakdonggang, formerly Byeonhan territory. In its early stages, Gaya was centered aroundGeumgwan Gaya in the Gimhae area of Gyeongsangnam-do, which became a hub for international trade, providing iron to Nangnang and ancient Japan via sea routes. In the late 3rd century CE, the region increased its power by beginning to embrace the northern civilization, causing the center of activity to push northward to Dae Gaya in the Goryeong area of Gyeongsangbuk-do. Excavations of Gaya sites have yielded pottery inscribed with the “Great King” (大王), as well as flamboyant gold crowns, demonstrating that the state was strong enough to compete against Silla and Baekje. Gaya culture is characterized by stone chamber tombs that were dug vertically, various pottery with smooth curves, a proliferation of iron objects and weapons, and gold and silver inlaid techniques. In particular, artifacts excavated from Gaya tombs in Daeseong-dong (Gimhae, Gyeongsangnam-do); Dohang-ri (Haman, Gyeongsangnam-do); Okjeon (Hapcheon, Gyeongsangnam-do); and Jisan-ri (Goryeong, Gyeongsangbuk-do) illustrate the magnificence of Gaya culture. The Silla Kingdom (57 BCE – 676 CE) originated from the state of Saro in the Gyeongju region, and comprised 12 Jinhan chiefdoms from the southeastern part of the Korean Peninsula. The kingdom gradually expanded its territory by annexing small neighboring states, before officially declaring Silla laws in the 6th century CE. Around that time, the state accepted Buddhism as a governing belief system, which henceforth laid the foundation for the kingdom’s political and moral thoughts and actions. In 562 CE, Silla annexed Dae Gaya, paving the way for unification. Silla culture is represented by its Buddhist relics, as well as its distinctive wooden chamber tombs covered by stone mounds. Gold crowns and earrings excavated from such wooden tombs are among the most splendid and impressive gold handcrafts in the world, earning Silla the title of “The Country of Gold.” Silla society was profoundly influenced by the bone rank system (a hereditary caste system) and Buddhism, which dominated both social law and spiritual belief. Importantly, Silla culture had international aspects, including overseas exchange, as evidenced by foreign artifacts excavated from the Gyeongju region, as well as traces of western culture found in burial mound figures. The Unified Silla Period (676-935 CE) began when Silla occupied the region stretching from the Daedonggang south to Wonsan Bay, conquering Baekje and Goguryeo to form a unified nation-state. The capital city of Gyeongju took the form of a castle town that organized and governed all the neighboring settlements. Gyeongju grew into an international city through active exchange with Southwest Asia, the Tang Dynasty of China, and Japan, and the advanced culture of the capital city gradually diffused into the local areas. During the Unified Silla Period, Buddhism brought about major changes in society and culture. Cremation became the preferred funerary procedure, with burial urns replacing tombs, and major Buddhist architectures such as Bulguksa Temple and Seokguram Grotto were established. By integrating the cultures of Goguryeo and Baekje, Unified Silla formed the basis for a national culture. To effectively rule such a huge territory, Balhae had five gyeong (provinces) and moved its capital city several times. The capital cities of Sanggyeong, Junggyeong, and Donggyeong all featured impressive architecture and exquisite artworks, such as roof tiles, bricks, dragon heads, potteries, weapons, and various Buddhist sculptures. Balhae enjoyed a vibrant exchange with Unified Silla, as well as the Tang Dynasty and Japan. Following the fall of Balhae, some of its citizens joined Goryeo (918-1392) and sustained the Balhae’s legacy in Korean history. Goryeo was founded by Wang Geon with Songak (present day Gaeseong in North Korea) as its capital. It incorporated Shilla in 935 and destroyed Later Baekje in 936, reuniting the Korean Peninsula. Goryeo’s state religion was Buddhism and its main goal was to enlarge its territory to the north. The later years of the Goryeo Dynasty were marred by the invasion of Mongols, who subjugated the Goryeo royalty. Barely holding onto its sovereignty, Goryeo was able to get it back as China was embroiled in a chaotic struggle between the outgoing Yuan Dynasty and the incoming Ming Dynasty. However, military officials gained power over the monarchy and the Goryeo Dynasty was usurped by Yi Seong-gye, the founder of the Joseon Dynasty. The Goryeo Dynasty lasted for 474 years. General Yi Seong-gye and military officials established the Joseon Dynasty by forcing the last Goryeo king to abdicate his throne, thus completing a bloodless coup. The new Joseon Dynasty aimed to reform the old Goryeo government with Confucianism as the guiding principle. It was a unique dynasty because although the king had absolute power, he was checked and balanced by Confucian noblemen and scholars and had to follow certain life patterns and administrative styles governed by the strict Confucian political philosophy. Joseon made a number of notable scientific and cultural achievements, like the creation of Hangeul and invention of the rain gauge and other machinery. However, it turned into a closed and inert society in later years as its ruling class became obsessed with the rigid observance of the Confucian ideology and refused to open itself to new and practical ideas from foreign countries. Xenophobic policies in the late 19th and early 20th centuries hampered Joseon from catching up with the rapidly changing world and eventually led to the Japanese colonization in 1910.